I am having a problem every night i plug my nexus 5 to charge and then in the morning when i take it off the charger i look at the battery level and it instantly turns to 99%. Every morning when I take my nexus 5 off the charger the battery level drops to 99%. Why does this happen? why doesn't my nexus 5 want to stay at a 100%? They all do that; the Nexus 4's do it also. Could just be the rounding algorithm; maybe 99.999% rounds DOWN to 99% rather than UP to 100%. If that is the case, the phone could never remain at exactly 100% for more than a second or two. ya but it just frustrating looking at a new phone do this. Seriously? Find something else to complain about! cgardnervt, yfan, Biggnaa20 and 3 others like this. +1! Its nothing new. Even my HTC One does this. When your phone hits 100% it stops charging to avoid overcharging the battery. It will drop to 1% or 2% before topping it off again. This is normal for almost all phones. Jonneh, Adamsberg, NexusNick123 and 1 others like this. Estimating the energy left in a battery is an extremely imprecise science. Generally above 90% it is very difficult to tell what the actual charge is. That is why some phones stop charging anywhere between 90 and 100. Thats also why some phones seem to die from 100-90 very quickly. This is normal op, if it ever says 100 for a long time your system is messed up. This. No phones keeps charging the entire time it's plugged in - and you wouldn't want it to. this is not what OP was asking. In all seriousness, how many days/cycles do you have on your battery? Mine does actually stay at 100% until I get a bit of screen use and it updates. On topic though, OP, I think you should get rid of that POS phone and get a new one. I think I might be able to manage with a phone that only charges to 99%, I mean it will be a terrible struggle to get through the day, and I'll probably be exclaiming FML a lot, but for you, I think I'll take that hit. Seriously, PM me and I'll get you my address where you can ship your little turd. Android phones of the first generation showed this dropping while charging. But this confused the user ... and now, when our phones reaches 100% then they stay on showing 100%. 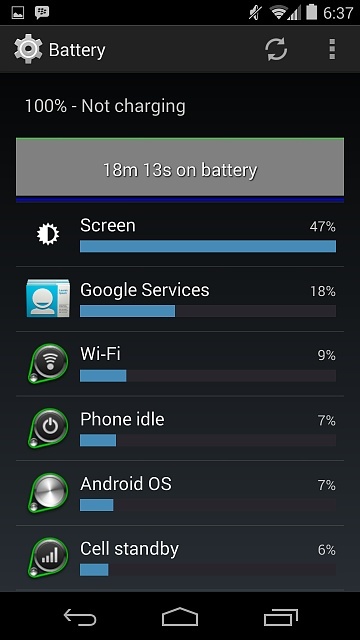 I get 15-17 Hours of battery with my N5 and I'm happy with that.. I never noticed if mean did this but even if it does if you get a full day battery why let it bother you.. Just saying not trying to be rude..
Too late to get a Moto X? N5 battery down to 58% overnight, normal? Period to sync email - what does "Automatic"mean?